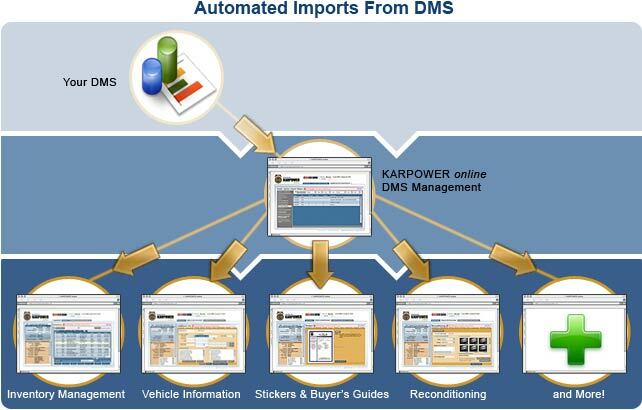 Speed up your book-in process through KARPOWER Online’s® DMS Import capabilities. Our experienced staff will ensure that your vehicle information is transferred securely and accurately on a daily basis. Save time so you can focus on getting your customers into their new vehicles. Nightly automated imports from your Dealer Management System not only save you from the hassle of re-entering vehicle information, it also ensures that your KARPOWER Online account is up to date and accurately reflects your DMS. DMS data can be imported and synchronized with your online inventory on a daily schedule. The daily updates work in tandem with KARPOWER Online’s Automated Export feature, ensuring that your vehicles are priced accurately on the Web. KARPOWER Online decodes all new vehicles imported into your inventory using the Kelley Blue Book VIN Decoder. Use your time more efficiently. Eliminate wasted effort recording and typing in VIN’s. Once the imported vehicle(s) has been verified as a new addition, it will be automatically decoded and placed into a Pending Inventory category for your review. This process lets you know exactly which vehicles need to be worked on that day. When you import vehicles with a sold date and price, these vehicles can then be automatically updated and moved into your Sold Inventory category. Auto-Archive works in tandem with KARPOWER Online’s Automated Export feature to ensure that your online classified listings are current. Concerned about your inventory being successfully transmitted for placement on the Web? Rest assured with KARPOWER Online’s Export Status log. Monitor your import process with KARPOWER Online's detailed reports and know from a glance whether imports were successful or if issues require your attention.